Moto Mania is a sidescroller dirt bike game app where you control your biker through a variety of levels, navigating past obstacles, hitting ramps, and correcting your position to land properly. 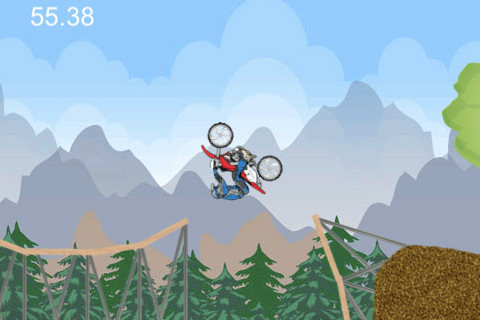 Released by William Garrett, Moto Mania is available on the iPhone, iPod touch, and iPad for $0.99. Moto Mania controls with the tilting of the iDevice to rotate the biker and each time you jump, you have to land properly or else you will land hard and see the little biker dude go completely limp and ragdoll all over the floor screaming. It’s an interesting game, that’s for sure! You have 20 different levels to play in, 10 being in the country side with hills, mountains, ramps, and pits, and 10 being in the city with cars, -piles- of cars, giant man-holes, and dogs. The high variety really does help alleviate the game from becoming too repetitive with its simple control scheme and gameplay mechanic, though I have to question the logic of this game. When do cars ever pile up? Ever? When do police run you over for speeding? Ok, granted, I have played Grand Theft Auto and games similar, but still, I question those games too. When is there ever a pit of death sitting in the road that’s the diameter of a full car? What terrifying city is this? This app takes the raw, fast, dirty dirt-bike racing and puts it on tiled grass textures and the strangest car stacking ever. The graphics are mixed. Your biker has a lot of details with black edges and black detailing and for whatever reason; the trees in the country levels look really detailed. The background, obstacles, and sky however, are almost always solid colors with light detailing and soft gradients. It does help the biker stand out from the background, but it really points out how undetailed everything is. This is really contrasted by the horrible tileable texture that is the grass. It’s green static. I find that it really gives the wrong impression of what quality Moto Mania is when the first thing they present is a giant static storm of green that takes up 50% of the screen. I would have liked to see more detailing in the background or, to reverse on that, the biker looking cartoony. This is essentially Line Rider on a motorbike with pre-created levels. The biker’s sudden case of paralysis when he touches the environments are entertaining when he hits and falls, but the game feels like you aren’t really having fun playing it. If Moto Mania didn’t constantly rotating your biker off balance and landing in awkward positions, I wouldn’t have done a thing during the game. By level 1 I was already starting to get bored. By level 6, I was. Finishing the country levels didn’t feel like an accomplishment, it felt like I was tuning out. This is not a bad game. It just feels boring. I want fast, rough, dirty biking when I see a Moto-style game. It’s the danger, the spectacle of watching a guy smash into stuff. Maybe some particle effects when the biker hits a wall? Maybe a level where pyrotechnics go off and there are crowds watching? This is an average game at best and I have to bring into question why people are rating this 5/5 when so many other games bring true excitement and entertainment. This game can be a 5 star game, but not as it is now. Good job so far however. AppSafari review of Moto Mania was written by Joseph Ho on October 23rd, 2010 and categorized under App Store, Games, iPad apps, Racing. Page viewed 3782 times, 1 so far today. Need help on using these apps? Please read the Help Page.